The NGET1 is actually 'engineered' by Manfrotto for National Geographic. 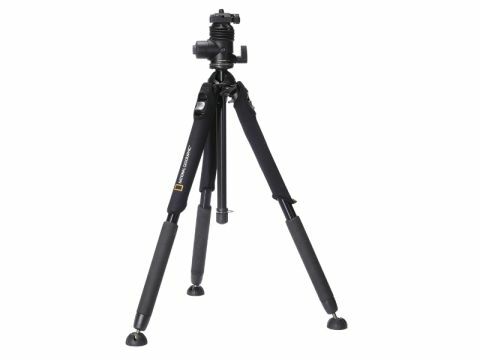 It doesn't take too much detective work to spot the similiarities between this tripod and Manfrotto's 458B tripod and 468MG hydrostatic ball head. Some leg-warmers and articulated 'cup' feet have been added, along with protective rubber bellows around the shaft of the head. The leg-warmers are too loose to grip the tripod properly, and the cup feet are better suited to polished floors. The bellows feel thin and delicate. Underneath, though, this is a very interesting tripod. There are no leg catches. Instead, an internal clutch mechanism enables you to pull the leg out but locks it rigidly in the new position so it won't push back in. The legs are released by a button right at the top. It's very clever and a fast tripod to set up. The centre column splits and reassembles as a boom.